Back by popular demand: the conference badge competition! Showcase your creative talent by designing a SCBWI badge and be in with a chance to see your badge on sale at November’s conference. The winner will also receive a full set of the 2018 badges while the runner-up will receive a half-set. Design a circular badge (please ensure there’s a generous bleed in your artwork). Include the SCBWI logo (below). All entries MUST include the logo. Send your entry to zoe@madgereviews.co.uk no later than midnight on Saturday 1st September. You don’t need to attend the conference to enter – but you do need to be a paid-up SCBWI member. Stuck for ideas? 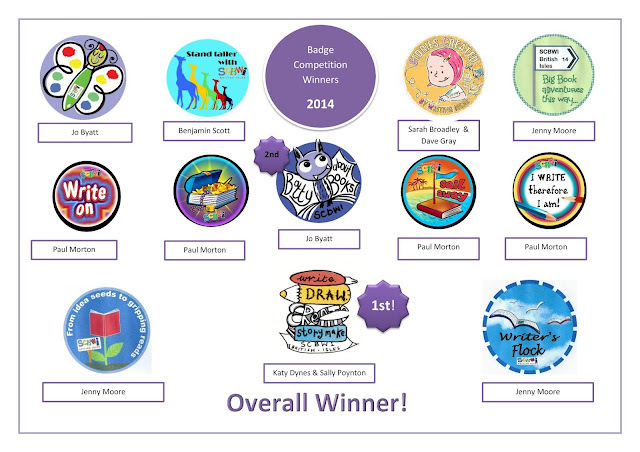 Check out the 2014 winners (above in the featured image). Writers - if you can’t find anyone to illustrate, you can enter a maximum of two slogans and we will try to find someone. Question or query? Email me at zoe@madgereviews.co.uk. Zoë spent fifteen years in the grown-up world before quitting her management job in 2013 to write for a living (albeit mostly reports, funding bids and business cases). A voracious reader of children’s books, she recently launched her own children’s book review site – Madge Eekal Reviews (www.madgereviews.co.uk) – where she loves to promote fellow SCBWI members. Zoë has an MA in Writing for Young People from Bath Spa University. She enjoys writing for children of all ages and has a particular love of middle-grade action adventures.